Shirts With Random Triangles: Alabama adds California quarterback prospect Blake Barnett to its 2015 recruiting class. Alabama adds California quarterback prospect Blake Barnett to its 2015 recruiting class. Alabama added a major piece to its 2015 recruiting class on Wednesday. Corona, Ca. 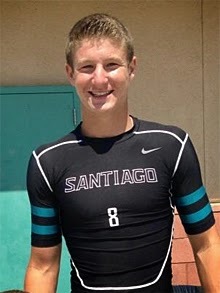 high school rising senior quarterback Blake Barnett announced his commitment to 'Bama on Bleacher Report. Barnett also made announcements of his commitment on Twitter and Instagram. Barnett previously has committed to Notre Dame, but had decided that he just wasn't into the Fighting Irish, and decommitted from the school back on June 4. Here are Barnett's 247Sports.com composite intangibles: Barnett is a four-star rated dual threat QB. He is ranked as the 10th-best recruit from the state of California, the third-best dual threat QB prospect, and the 68th-best overall recruit in America. Barnett attends Santiago High School in Corona, Ca. He stands 6 feet, 3.5 inches tall, and weighs 195 pounds. Barnett becomes the 19th member of Alabama's 2015 recruiting class.